Himax motors have been proven to be a lot of motor for the money. 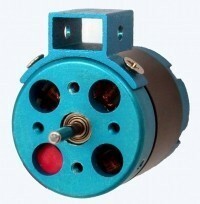 I feel you get a very good value and highly efficient motor for your projects. I fly many of these myself. These are my motor of choice for my prototype models and demonstrators. They are durable, well made and efficient. All come with Japanese bearings. None of these motors are 50-60% efficeint junk like so many of the imports are. ALL parts are available for these motors. Radical RC keeps 90% of them in stock at all times. For all motors, we stock shafts, bearings, E-clips, spacers, mounts, factory prop adapters and we even stock the inrunner rotors. Any part your likely to ever need, we can ship today. The provided Performance Charts are my own suggested setups and may vary from manufacturers suggestions. Some of these setups are outside the manufacturers wattage specifications. Understand you can get more wattage with more voltage as long as you don't violate the amperage limits your fine in most cases. Any power system should be checked with a watt meter and temp guage prior to flight and during several steps as you gradually increase the agressiveness and length of initial test flights. Himax Brushless motors are manufactured to high standards for the discerning modeler. Designed for light-weight, high efficiency, high torque and durability Himax Outrunner motors are sure to make today's radio controlled models perform. The HC2208 series motor is made for small to medium size models weighing 6 to 10 ounces. Prop adapter and versatile mounting hardware included. Package includes collet type bolt on prop adapter, prop saver, bullet females for your ESC and fasteners. Estimates based on manufacturers provided constants using E-Calc. High Quality 1200mah used as trial cell in calculations. Actual performance may vary depending on components used, accuracy of data as provided by manufacturer, quality of ESC, weather and many other variables. Himax Brushless motors are manufactured to high standards for the discerning modeler. Designed for light-weight, high efficiency, high torque and durability Himax Outrunner motors are sure to make today's radio controlled models perform. The HC2208 series motor is made for small to medium size models weighing 6 to 10 ounces. Replacement for N60-280 motors. Package includes collet type bolt on prop adapter, prop saver, bullet females for your ESC and fasteners. Himax Brushless motors are manufactured to high standards for the discerning modler. Designed for light-weight, high efficiency, high torque and durability Himax Outrunner motors are sure to make today's radio controlled models perform. The HC2212 series motor is made for small to medium size models weighing 6 to 10 ounces. Replacement for N60-280 motors. Package includes collet type bolt on prop adapter, prop saver, bullet females for your ESC and fasteners. HC2212-1180 Kv=1180, Rm=.300, lo=0.50, Eff. Op current=1-7A,8.5A Max 15 seconds. Estimates based on manufacturers provided constants using E-Calc. High Quality 340mah used as trial cell in calculations. Actual performance may vary depending on components used, accuracy of data as provided by manufacturer, quality of ESC, weather and many other variables. Himax Brushless motors are manufactured to high standards for the discerning modeler. Designed for light-weight, high efficiency, high torque and durability Himax Outrunner motors are sure to make today's radio controlled models perform. The HC2808 series motor is made for small to medium size models weighing 9 to 20 ounces. Replacement for 370-400 motors. Package includes collet type bolt on prop adapter, prop saver, bullet females for your ESC and fasteners. Himax Brushless motors are manufactured to high standards for the discerning modeler. Designed for light-weight, high efficiency, high torque and durability Himax Outrunner motors are sure to make today's radio controlled models perform. The HC2812 series motors are made for small to medium size models weighing 9 to 20 ounces. Replacement for 370-400 motors. Package includes collet type bolt on prop adapter, prop saver, bullet females for your ESC and fasteners. Estimates based on manufacturers provided constants using E-Calc. High Quality 1250mah used as trial cell in calculations. Actual performance may vary depending on components used, accuracy of data as provided by manufacturer, quality of ESC, weather and many other variables. Himax Brushless motors are manufactured to high standards for the discerning modeler. Designed for light-weight, high efficiency, high torque and durability Himax Outrunner motors are sure to make today's radio controlled models perform. The HC2816 series motors are made for medium size models weighing 9 to 20 ounces. Replacement for 370-400 motors. Estimates based on manufacturers provided constants using E-Calc. High Quality 2100mah used as trial cell in calculations. Actual performance may vary depending on components used, accuracy of data as provided by manufacturer, quality of ESC, weather and many other variables. This is one of my favorite motors with many applications. 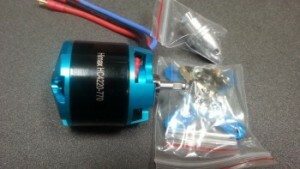 I've used this motor for setups from converting 10 to 25 size models, sailplanes and larger park flier models. Left most motor in photo is the 3510 series motor. Himax 3510 series motors are most generally used in models 1.5 to a little over 3lbs depending on application. Replaces AXI 28 series motors. Manufactured to high standards for the discerning modeler. Package includes collet type prop adapter, prop saver, bullet females for your ESC and fasteners. Estimates based on manufacturers provided constants using E-Calc. High Quality 2200mah used as trial cell in calculations. Actual performance may vary depending on components used, accuracy of data as provided by manufacturer, quality of ESC, weather and many other variables. Himax 3514 motors are part of a new breed of larger high KV outrunners. Excellent in direct drive and geared applications. The is the same motor included in the Multiplex Fun-Jet Ultra power pack and ran as a prop jet. Excellent direct drive in any model intended to run big watts at high speeds. An almost unbelievable combination of specifications. This motor could be in the a worlds record fastest model someday. Manufactured to high standards for the discerning modeler. Package includes collet type prop adapter, prop saver, bullet females for your ESC and fasteners. Second from left motor in photo is the 3516 series. 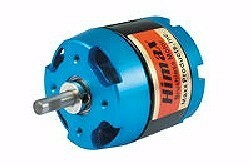 Himax 3516 series motors are most generally used in 34-70 oz models depending on application. Replaces AXI 28 series motors. Manufactured to high standards for the discerning modeler. Package includes collet type prop adapter, prop saver, bullet females for your ESC and fasteners. Estimates based on manufacturers provided constants using E-Calc. High Quality 2200mah used as trial cell in calculations. Actual performance may vary depending on components used, accuracy of data as provided by manufacturer, quality of ESC, weather and many other variables. * Over reccomended maximum RPM. Third from left motor in photo is the 3522 series. Himax 3522 series motors are most generally used in 34-90 oz models depending on application. Replaces AXI 28 series motors. Manufactured to high standards for the discerning modeler. Package includes collet type prop adapter, prop saver, bullet females for your ESC and fasteners. Right most motor in photo is the 3528 series. Himax 3528 series motors are most generally used in 34-90 oz models depending on application. Replaces AXI 28 series motors. Manufactured to high standards for the discerning modeler. Package includes collet type prop adapter, prop saver, bullet females for your ESC and fasteners. I love this motor in the .40 to .60 class models and glow conversions. Generally ships weighing 4.5 to 8 pounds, floaty models could be even larger. HC42 Outrunners generally used from 500-1000 Watts. High torque to turn large props direct drive. Replaces .40-.60 size engines. Mounting hardware and connectors included. Himax Brushless motors are manufactured to high standards for the discerning modeler. Designed for light-weight, high efficiency, high torque and durability Himax Outrunner motors are sure to make today's radio controlled models perform. Recent report from a .40 size pattern Kyosho Sensation. Pilot reports better than any fuel plane in ever flown in this class. Setup is 5S Kypom 4200, 11x7 APC-E, Castle Edge Edge 75. 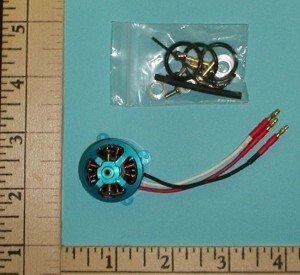 Motor includes: Prop adapter, female wire connectors, motor mounting flange. Estimates based on manufacturers provided constants using E-Calc. High Quality 3200mah used as trial cell in calculations. Actual performance may vary depending on components used, accuracy of data as provided by manufacturer, quality of ESC, weather and many other variables. These motors are for large models weighing 4.8-5.8Lb for 3-D flight, up to 9.5Lb for aerobatic flight and 14Lb for leisure flight. HC50 Outrunners generally used from 800-1500 Watts. High torque to turn large props direct drive. Replaces .40-.60 size engines. Mounting hardware and connectors included. Himax Brushless motors are manufactured to high standards for the discerning modler. Designed for light-weight, high efficiency, high torque and durability Himax Outrunner motors are sure to make todays radio controlled models perform. All HC50 series outrunner motors include: Prop adapter, female wire connectors, motor mounting kit w/screws and two hex keys. 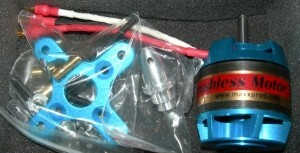 Also included is base for standoff motor mount kit ACC3650 sold seperately. These motors are for large models weighing 6.5-8Lb for 3-D flight, up to 13Lb for aerobatic flight and 20Lb for leisure flight. Generally used 800-1500 Watts. High torque to turn large props direct drive. >Replaces .40-.60 size engines. Mounting hardware and connectors included. Himax Brushless motors are manufactured to high standards for the discerning modler. Designed for light-weight, high efficiency, high torque and durability Himax Outrunner motors are sure to make todays radio controlled models perform. All HC50 series outrunner motors include: Prop adapter, female wire connectors, motor mounting kit w/screws and two hex keys. These motors are for large models weighing 10-12Lb for 3-D flight, 17-22Lb for aerobatic flight and 22-30Lb for leisure flight. High torque to turn large props direct drive. Mounting hardware and connectors included. Himax Brushless motors are manufactured to high standards for the discerning modler. Designed for light-weight, high efficiency, high torque and durability Himax Outrunner motors are sure to make todays radio controlled models perform. All HC63 series outrunner motors include: Prop adapter, female wire connectors, motor mounting kit w/screws and two hex keys. These motors are for large models weighing 10-12Lb for 3-D flight, 17-22Lb for aerobatic flight and 22-30Lb for leisure flight. High torque to turn large props direct drive. Mounting hardware and connectors included. Himax Brushless motors are manufactured to high standards for the discerning modeler. Designed for light-weight, high efficiency, high torque and durability Himax Outrunner motors are sure to make today's radio controlled models perform. This monster was created as a replacement for the YS170, Plattenberg Evo 20-10 class motors so common in pattern competition today. However, it has MANY more uses. All Himax motors come equiped with Japanese bearings, so no replacing them right out of the gate like most of the other brands. Estimates based on manufacturers provided constants using E-Calc. High quality 3200 used as trial cell in calculations. Actual performance may vary depending on components used, accuracy of data as provided by manufacturer, quality of ESC, weather and many other variables.